Adair County Elementary School held its 2nd annual Health and Fitness Day on October 6, 2017. Students rotated to different lessons during the day. Third grade students were educated on topics such as poison prevention, how the lungs and brain work, dental care and proper hand washing. Fourth grade activities included yoga, dance, learning about germs, healthy minds and the importance of proper diet related to sugar and water intake. Fifth grade lessons were healthy heart/CPR, dance, fitness, drugs and you, proper sleep. ACES would like to thank the following community members for a successful Health and Fitness Day: ACHS SADD Club (Jaime White), Care Source (Robin Smith), Healthy Kids Clinic, LWC PE, ACHS Cadet Corps. (Crystal Redman), TJ Health, Adanta, LWC (Yoga Man), 4-H, Damon Hicks, ACHS HOSA Students, LWC (Haley Cook), Summit Manor, and Patricia Harper, R.N. 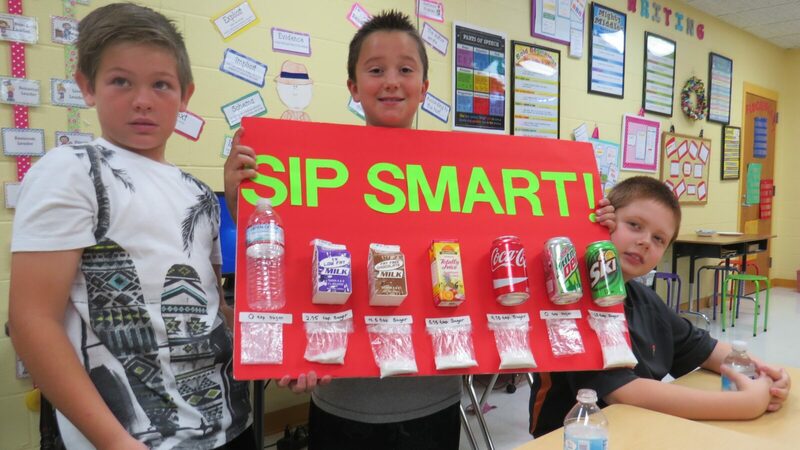 Photo Below-Clinton Grider, Tristen Stotts and Dakota Reynolds were amazed at how much sugar is in our everyday drinks.